More than 15,000 area students will take STEM tours at Charlotte Motor Speedway this year, but Tuesday's tour was unique in that it featured North Carolina's highest-ranking official in attendance. Gov. 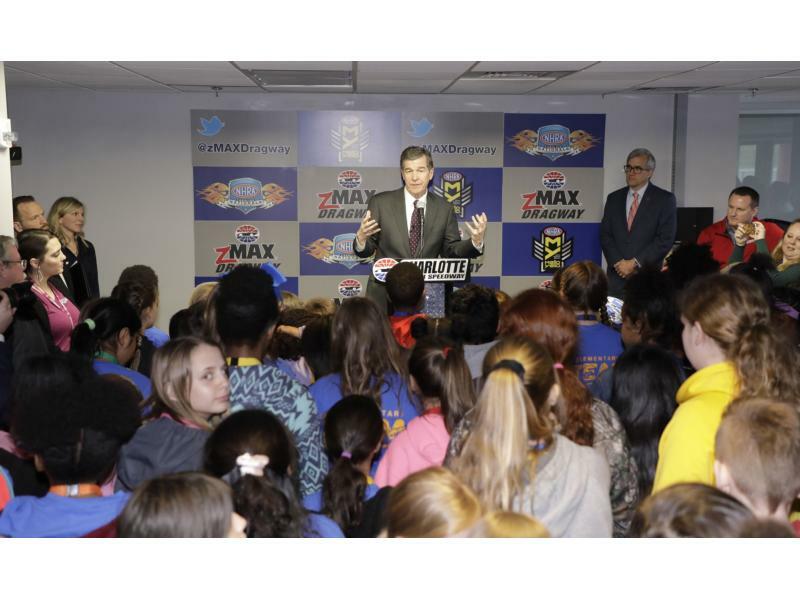 Roy Cooper made his first visit to zMAX Dragway to join local students in taking an informative, entertaining STEM (Science, Technology, Engineering and Math) tour. Gov. Cooper's visit came as part of the North Carolina Business Committee for Education's Students@Work program. Students@Work provides middle school students from across the state with an in-depth look at business environments in their communities. 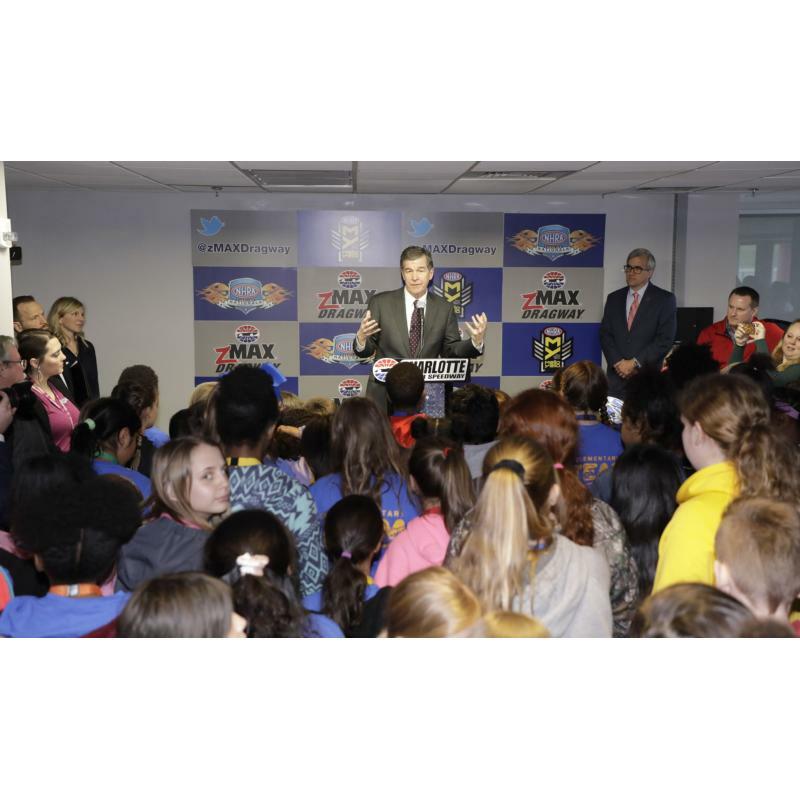 Cooper joined 200 students from Carr Elementary in Dallas, North Carolina; Finley Road Elementary in Rock Hill, South Carolina; and Geiger Elementary in Ridgeway, South Carolina, in learning lessons on racing-related academic subjects including acceleration and friction. Following the tour, Cooper addressed a group of students about the importance of education and how programs like STEM provide students with the tools they need to succeed in the workplace. "One of the things that I continue to hear across North Carolina is from CEOs who tell me that we have available jobs but we need the trained people to fill them," Cooper said in remarks to media. "One of the reasons why we're standing here today is we're trying to prepare our middle schoolers for the jobs of the future. The job landscape will look markedly different when these students graduate from high school. "We're going to have a lot of success as long as we assure these companies that we have the well-trained workforce for them. … With STEM jobs, which we're emphasizing today here at the dragway, we know we're looking in the right direction for sure." Concord Mayor Bill Dusch, Cabarrus County Schools Superintendent Dr. Chris Lowder and Gaston County Schools Superintendent Jeffrey Booker also attended the event.